I ‘m not a person who gets lemons and immediately starts making lemonade, or a lemon pie, for that matter. So when two of my novellas were unpublished as part of the Kindle World, I just let them vanish. I procrastinated. But then…. I couldn’t let them go. The story about the heroine and the child with diabetes was especially close to my heart. This was a very personal book and one I wanted to write for a long time. What if it could still touch many readers and hopefully even help some people whose family members and/or beloved ones suffer from diabetes? So I decided to move the setting to my beloved (though sadly only fictional) small Texas town, Rios Azules, and make the stories bigger and better (by design, they were shorter novellas in the beginning). And so Season of Romance and Season of Love were born as part of the Rios Azules Romances: the Macalisters series. It took me much longer than I’d anticipated to have them ready for publication. I added so many new scenes and revised them so much they became nearly twice bigger. And while Season of Love remained fun and light-hearted, I added an important spiritual message I learned the hard way. I’ll admit that I enjoy giving new life to old things and it takes me a while to give up on something I’m used to, be it books or clothes. I guess I don’t like to let go things I’m familiar with and that can still can be useful for a long time! Then it got complicated. I like thinking in the terms of trilogies, so I needed a third book in the series. Thankfully, there were four of the Macalister siblings, so it seemed fair for Ray Macalister, who grew up with three sisters, to get his story. As Ray was a nurse, I put a new spin on the traditional doctor-nurse plot. But then Season of Amor… took an unexpected turn. While the first two books in the series are Christian romances, the plot in the book 3 started having suspense elements soon. I followed where the story led me. By the way, if all goes well, today should be the release day for Season of Amor! So I’ve done a lot of things I didn’t expect myself doing. I rewrote unpublished stories instead of writing new ones. I released a Christmas book (Season of Love) at the end of January when everybody releases them in October, November, or December. I used a Spanish word, “amor”, for “love” in one of the titles. And then I mixed genres in the same series! Are you the type of person who makes the best of the bad situation? Do you easily let go? And do you think I’ve made that lemonade? Or have I done a lot of mistakes the author shouldn’t be making? Giveaway! One randomly chosen commenter to this post will receive complete Rios Azules Romances: the Macalisters series (3 ebooks total) gifted via BookFunnel. The giveaway is open until 6 p.m. CST February 22nd, 2019. I look forward to reading your comments! Hi Alexa! Just received my copy of Season of Amour! No reason to include me in the drawing. Thanks for sharing your rewrite story. You did an awesome job on the rewrites and this avid reader applauds your out of the box thinking. Season of Romance and Season of Love are inspirational page turners. As a person I try to make the best of a bad situation., even if it is not alway easy to let go. Situations tend to shape us as individuals. Happy Release Day! Best wishes! Hi Renate! Many thanks for being such a wonderful supporter and for your kind words! And I truly appreciate you buying my new book. I hope you’ll enjoy reading it! And I couldn’t agree more. Situations tend to shape us as individuals. Best wishes to you, too! Hi Alexa, thanks for sharing the journey of this series. It is always interesting to hear where a story takes the author- something I did not even think about before inspyromance! Hi Wemble! That’s true, it depends on the situation and sometimes it’s necessary to stop and re-calibrate. Thank you so much for commenting and for being such a great supporter of Inspy Romance! Oh Alexa! I had no idea this set started out this way! And you sure did make the prettiest lemon pie! I so admire you for not giving up! You are an inspiration. I would have easily given up thinking it would never be good enough. I truly feel Ilya and Melinda’s story needs to be out there!! My husband has Type 2 and a Dear Friend has Type 1. I didn’t realize that on the inside, they could be hurting in some way. You don’t see it on the outside. And their story was a reminder to me to always always take a moment and really talk to them and to show them they are loved and cared for. We do that but the extra encouragement will go a long ways in their hearts. Thank you for bringing their story to life in such a heartfelt way! Hi Sharon! Your story nearly brought me to tears (in a good way). Thank you about the prettiest lemon pie! :) And it makes me so happy if my book could be an inspiration for someone. Living with a chronic life-long disease is very difficult. Praying for your husband and friend! And I so agree that extra encouragement will go a long way in their hearts. Thank you so much for such a wonderful comment! How exciting! I do think you did a wonderful thing getting those books out again but with a spiritual message included. I think everyone in this blog will appreciate those stories more (even with a suspense element — some of us also enjoy that genre). Congrats and will do our best to keep up. Thank you so much, Priscila! And that’s true, the new books are much spiritual than the unpublished ones. I appreciate your kind words. Ellie, that’s so true! He has a reason for everything. And I hope that the books are much better now. Thank you so much for commenting! Good morning, Alexa! I absolutely love what you have done in this series, I would say the lemons most definitely turned into the sweetest of lemonades! Paula, you’re so sweet! And thank you so much for reading the books twice, the original ones and revised and improved ones. I’m so glad you enjoyed Melinda’s story. I appreciate you commenting! You definitely made that lemonade! :) I like to think I’m the type to make the most of every situation, but deep down I do find it hard to let go or get past setbacks of sorts. Of course, it depends on the situation and my ability or willingness to take it to God, and it helps to have wise counsel speaking into my life. Congrats on all the book success! Dear Katy Eeten, thank you very much for your kind words! And I loved the way you said it. I need to take things to God more often. I appreciate you stopping by! MJSH, lol! I love lemon pies, cakes, and cookies! I was interested in reading this series after reading this email so I’ve purchased the first 3 and will start reading them as soon as I finish the one I’m on at this time. Keep make lemonade or pies from your lemons. Brenda Day, you made my heart sing! Thank you so much for purchasing three books in the series. I hope you’ll enjoy reading them! I just started reading Season of Romance and am really enjoying the story so far. I like to think of myself as someone who makes lemonade out of lemons, but in reality I probably do it more begrudgingly than I should. Hello Melynda! 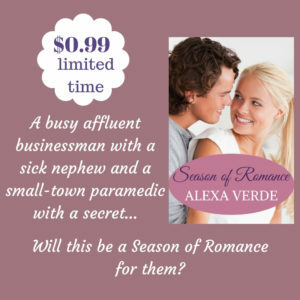 Thank you very much for reading Season of Romance, and I’m so glad you’re enjoying it. I can relate to “begrudgingly” part. I often complain when I’m handed lemons, and it might take me a while before I even look for lemonade recipe. Praying for your nephew! Thank you very much for your kind words and commenting. Your books sound interesting. My grandmother struggled with type 1 diabetes for a long time. It would spike up and then drop. When she was confused I wasn’t always sure which way it had gone. She had frequent ER visits. Nowadays there are much better ways to manage it. God bless your writing journey. Thanks for sharing with us . Hi Diana! Thank you for your kind words about my book. So sorry about your grandmother. And I can imagine how difficult it was for the entire family. Medicine advanced a lot in treatment of diabetes, and I hope so much that cure will be found soon. God bless you! Thank very much for commenting! Alexa–It sounds like you did a great job with your series. I think it’s fun and great that you mixed things up a little. You know what your stories need. Great job. Hi Lindi! I went where the story took me, and here’s the result. Thank you very much for your kind words! I have a hard time with change and letting go and still have a lot of room for improvement in those areas. It sounds like you’ve done a great job with your lemons. I’m currently reading a Love Inspired suspense and am really enjoying it. Hi Jessica! I think it’s very understandable to dislike change. I often try to avoid change as much as I can. I used to read a lot of Love Inspired Suspense books. Loved them. And thank you so much for your kind words! I do try to make the best of bad situations because I know nothing takes God by surprise and He’s right there with me through the good times and the bad. As far as easily letting go, I suppose it depends on what we’re talking about. I easily let go of grudges, but not dreams that I feel like God is wanting me to pursue. I’m so glad you didn’t let your book idea go! Hi Jeanna! You said it beautifully that nothing takes God by surprise. And you’re so right, and I think we should let grudges go but never let go our dreams. Thank you so much for such a thoughtful comment! I have many friends who keep telling me that they are so disappointed that their children don’t want passed down things. I fixed that, I took them to their houses and left them. Then they can do what they want with them and I don’t have to know. Anyway, back to your questions. I think I’m both, sometimes I try to see the good in situations, and other times, I can’t see the end of the tunnel. As for you making lemonade, I think that the time was probably not right when you first started this series. Sometimes we have to realize, that maybe it was God who was saying not now, the time is not right yet. And for what reason, He decided, now is the time! I don’t think this is an author mistake. I think it was in Gods plan. Everyone makes mistakes. Believe me, I’ve made enough for all of us. I’m sure if you ask other authors, they will tell you about their mistakes. Just let go and let God take over. I know it’s not easy, and it takes a lot of work. Hello Jocelyn River! I’m always happy to meet a new reader. Glad you discovered about me on IG. Thank you for letting me know that romance series. I haven’t seen one that has two genres, so I’m a bit worried. I do enjoy reviving old works. I hope one day you’ll get a chance to revive stuff you set aside, and thank you so much for commenting! I try to make the best out of a bad situation. I enjoyed hearing how you rewrote the series. Thanks for the giveaway! Hi Kerri Norrod! I’m glad you enjoyed reading my post. Thank you so much for commenting, and best wishes in the giveaway! Congratulations, yes it sounds like you took that basket of lemons and made sweet lemonade. I try to be one of those people that make lemonade as soon as possible, or just let it go. It is so not worth stressing about or becoming bitter about. Hi Lori Smanski! Thank you for your kind words. And you’re right. If we can’t make something good out of it, it’s better to let it go and not stress about it. I appreciate you stopping by! I don’t make lemonade out of lemons, I freeze them and chuck them back at the universe. For me life is too short to waste fighting all the time. With my depression it is a daily struggle just to get done what I have to. So if something or someone is making my life harder than it already is, I will walk away and never look back. Hello Cassandra Myers! So sorry to hear about your depression. Praying for you. Thank you very much for commenting! My oldest daughter was diagnosed as T1D when she was four. She is now 23 and is managing her diabetes well. We love the freedom her insulin pump has given her. She’s been pumping for 17 years and we highly recommend it. Hello Arletta! My admiration to your daughter that she’s managing her diabetes so well. I agree with you about the insulin pump. So much better than insulin shots. Thank you for stopping by! So glad you didn’t give up on your stories. Hello Pam! Thank you very much for your kind words. 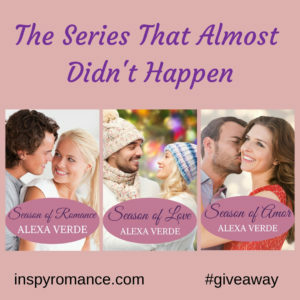 I just couldn’t let the series go… I appreciate you stopping by Inspy Romance! I’m reading Season of Romance right now – it was on my Kindle waiting for me to finish a couple of other books – life took a turn when my mid-80’s parents moved in with me – we have a great sour cream lemon pie recipe in my family – guess that’s what we do with lemons! I need to check out if I already have Season of Love – I just might have read things out of order! – and of course I ordered Season of Amor as soon as I saw it had released! Thanks for not letting these just go into oblivion! Hello Teresa! Thank you very much for reading Season of Romance and ordering Season of Amor. I truly hope you’ll enjoy them. And yay on sour cream lemon pie family recipe! It sounds delicious and a great use of lemons. Thank you so much for commenting! Some things I fight for, some things I give up on, lol. I guess it depends partly on my mood and what other things are fighting for my attention. I love the Rios Azules you have created and thoroughly enjoyed the first story. I have the others (or ordered) but have not read yet. Hello Andrea Byers! Thank you so much for sharing and for being such a great reader. I’m thrilled you like the community of Rios Azules. I did my best to write about a place where I’d love to live myself. And many thanks for buying and reading my books! Congratulations again and again and again Alexa! So happy you did it! Awwww, Natalya, you’re so sweet! Thank you so much! I always try to see the silver lining and the best in people. Hello, Gina Johnson! That’s a great attitude. Thank you so much for commenting! Congratulations Alexa Verde Thank you for the awesome giveaway love reading paperback books!